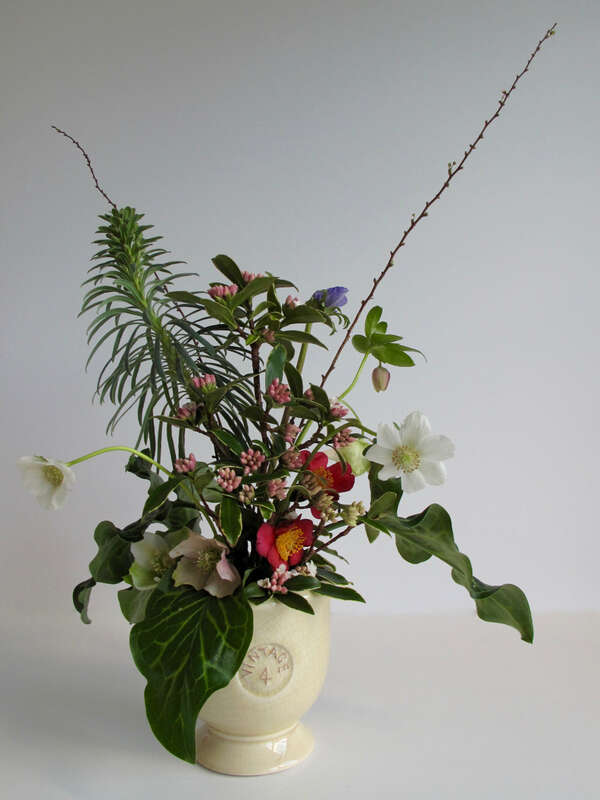 Monday brings the chance to share cut flowers from the garden by joining in Cathy’s weekly challenge In A Vase On Monday. 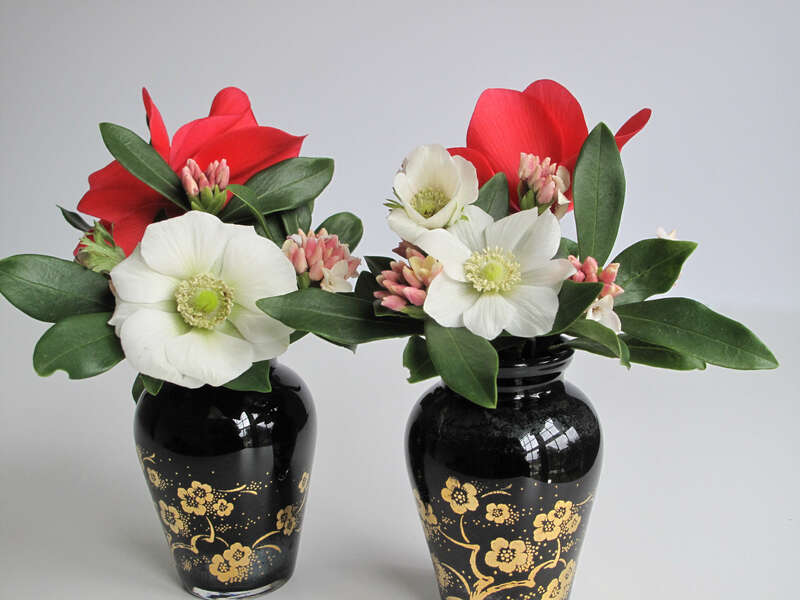 Especially in the winter season even a few blossoms brighten up the indoors. Yesterday morning on our way to brunch with friends we encountered snow flurries mixed with rain. The snow melted immediately but it breathed excitement into the short commute. Upon returning home the weather had cleared but it was cold. 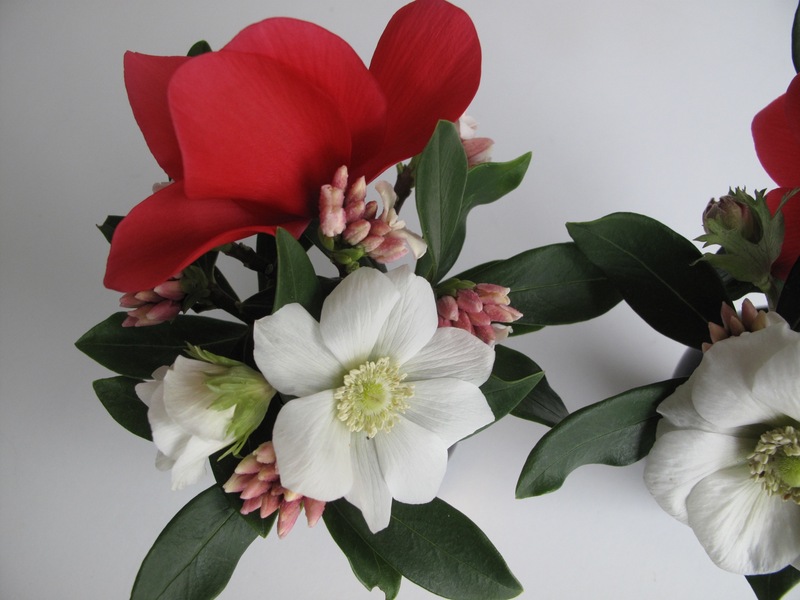 I foraged though the garden for today’s vase materials, quickly settling on three white Anemone coronaria. They appeared unfazed by the elements. 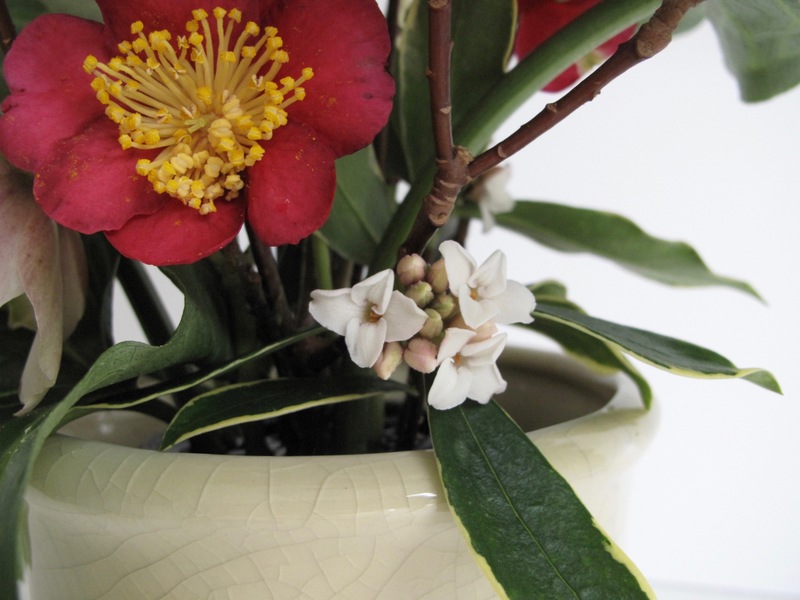 Again this week fragrant Daphne odora is used as filler. 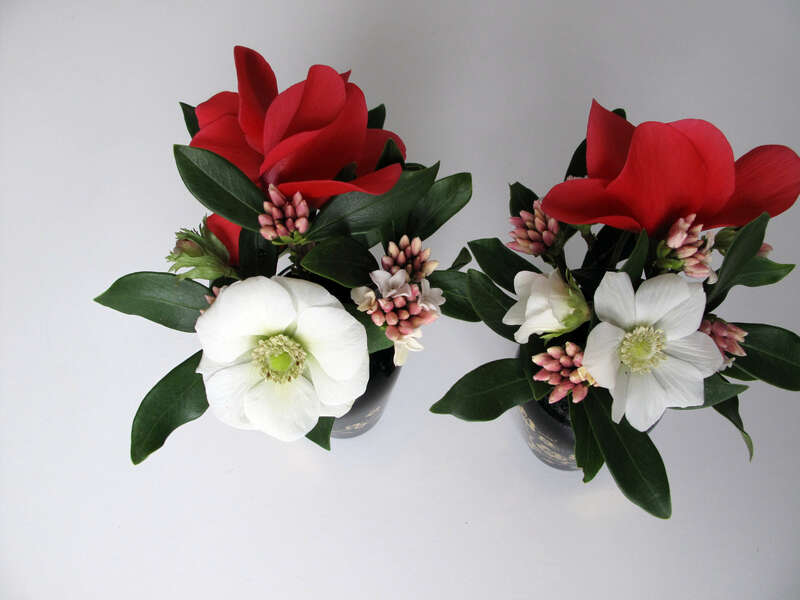 Three red cyclamen flowers from a house plant add a boost of color. 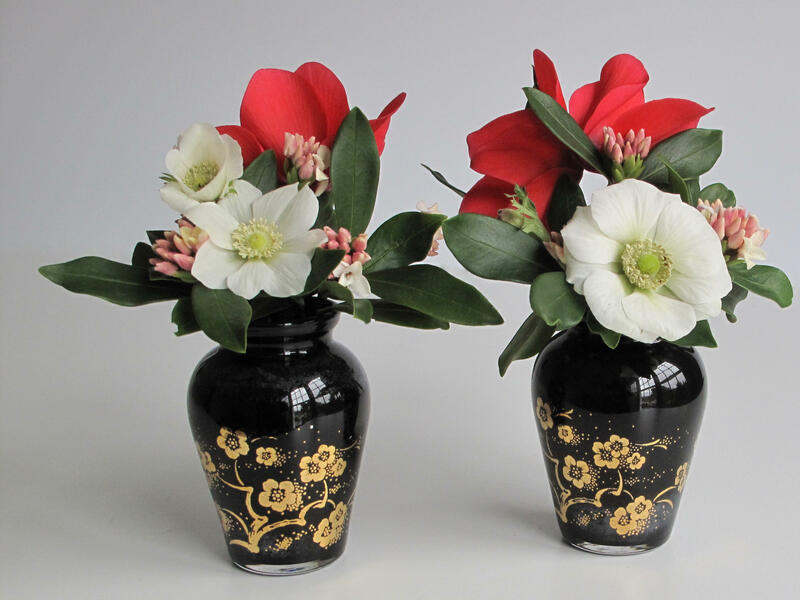 It was a difficult task finding a container for this odd mix, and I finally settled on a pair of small glass vases, painted black with a gold Asian floral motif. I believe these belonged to my grandmother. 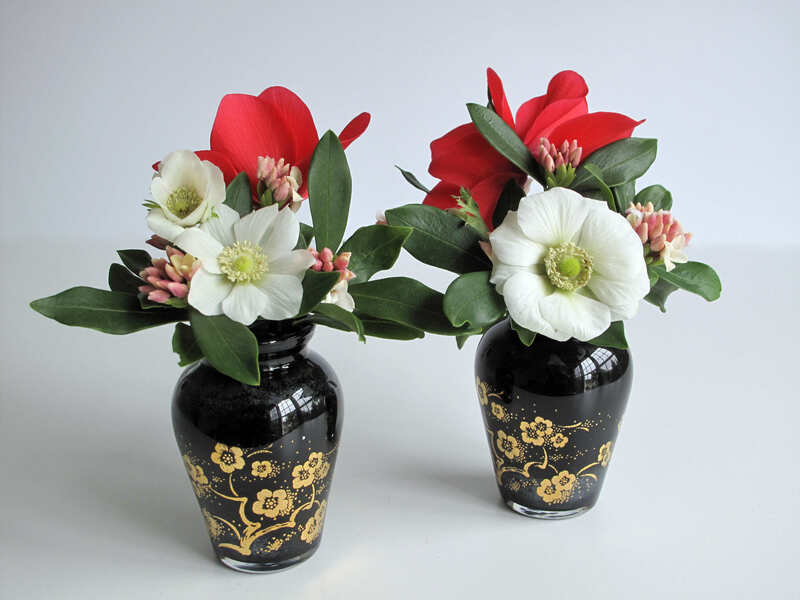 The shape of the gold flowers is repeated in the anemones and in the end the vases seem perfectly suited for the garden’s spare offerings. Photographing these flowers was fun. 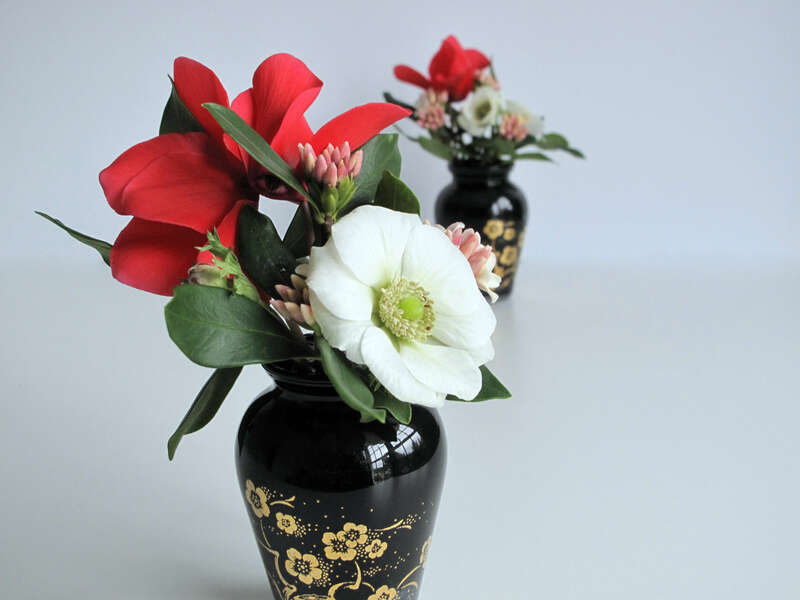 I reversed the order of the vases and experimented with perspective and point-of-view, finding pleasure in these simple winter flowers. I hope you enjoy them too. 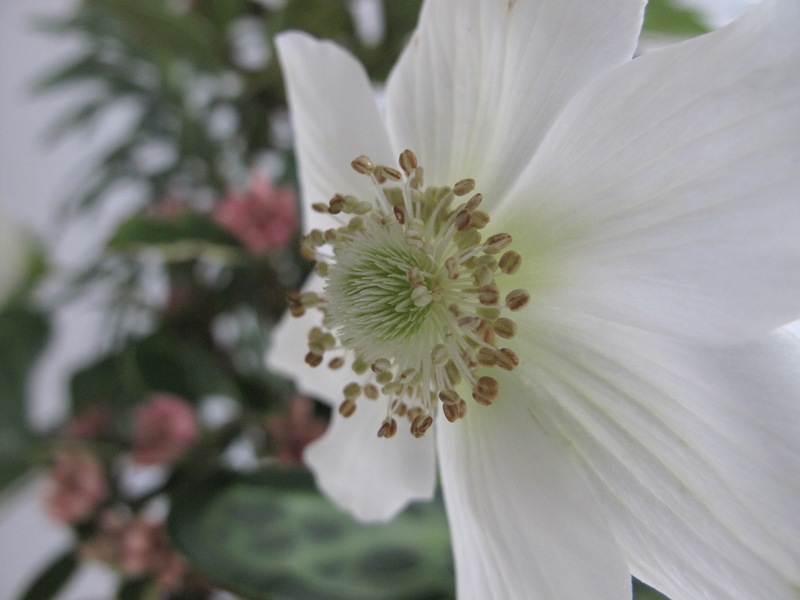 Thanks to Cathy for hosting this weekly flower addiction. 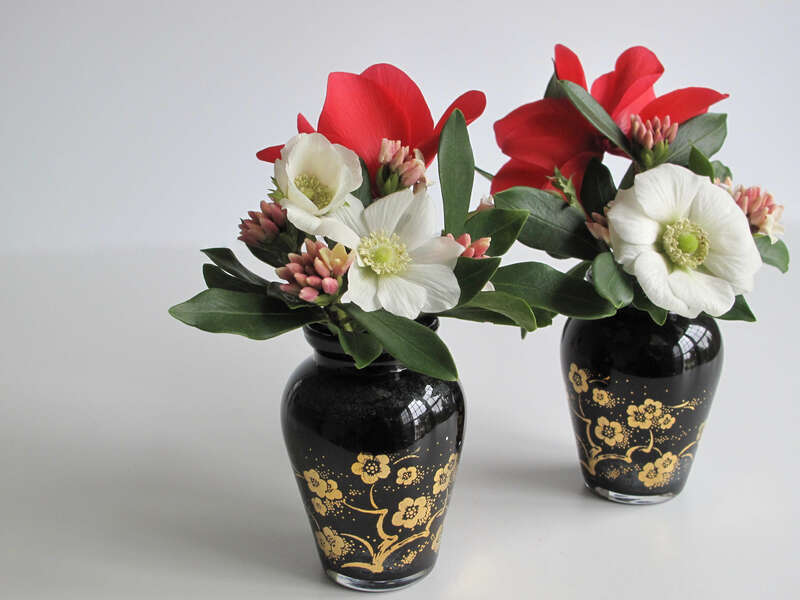 It is always interesting and insightful to visit her at Rambling In The Garden to discover what she and others are placing In A Vase On Monday and feel free to join in. This entry was posted in garden and tagged Anemone coronaria, cyclamen, Daphne odora 'Aureomarginata' (Winter daphne), flower arranging, flower design, in a vase on monday, nature photography on January 18, 2016 by pbmgarden. Today, Saturday, was a beauty of a day here in Chapel Hill with sunny skies and pleasant temperature of 61°F (16°C). In contrast, forecasts call for rain and maybe even a snow flurry Sunday morning and unseasonably cold on Monday with highs only in mid 30s and low 18°F. Just after the grass was cut yesterday another heavy rain started falling. The ground was completely saturated again this morning. I stitched together a panorama capturing most of the garden as it appeared around 8:45 a.m. looking westward from the top of the screen porch stairs. Sunlight was just reaching into the tops of the trees; the garden was still shaded. About an hour later I had a chance to inspect the borders more closely. 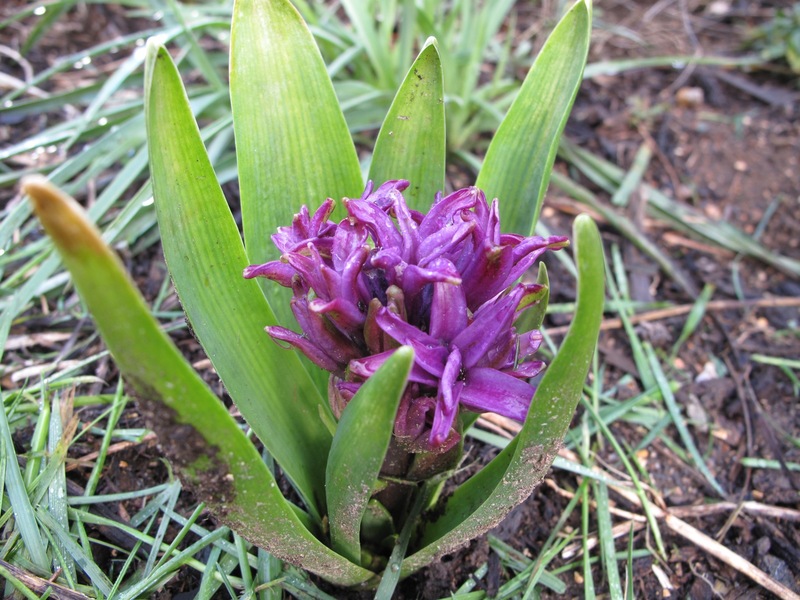 With leaves caked in mud this poor hyacinth, alternately enticed by days of warm sunlight and bashed by rain and cold, is the only one of its group to open. Others are up, but remain in tight bud. 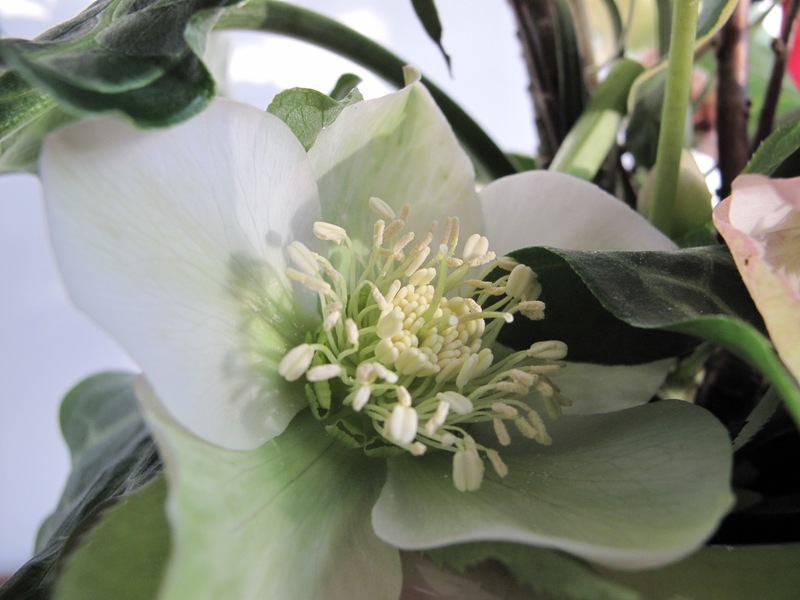 By this time of year it is not unusual to have Hellebores in bloom; however, despite the many warm days this winter they do not seem to be opening very quickly. There are lots of buds. 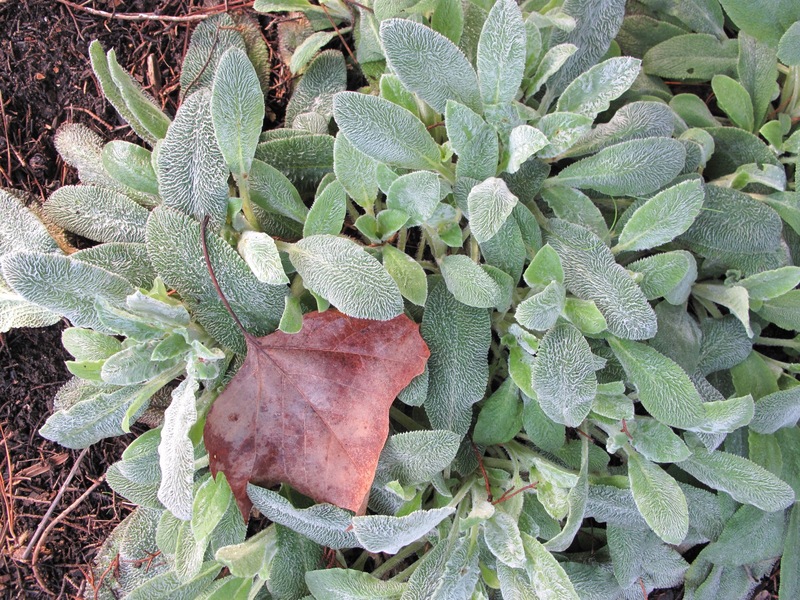 Stachys byzantina (Lamb’s Ear) is spreading far and wide. Fortunately it is easy to pull out when it oversteps its welcome. 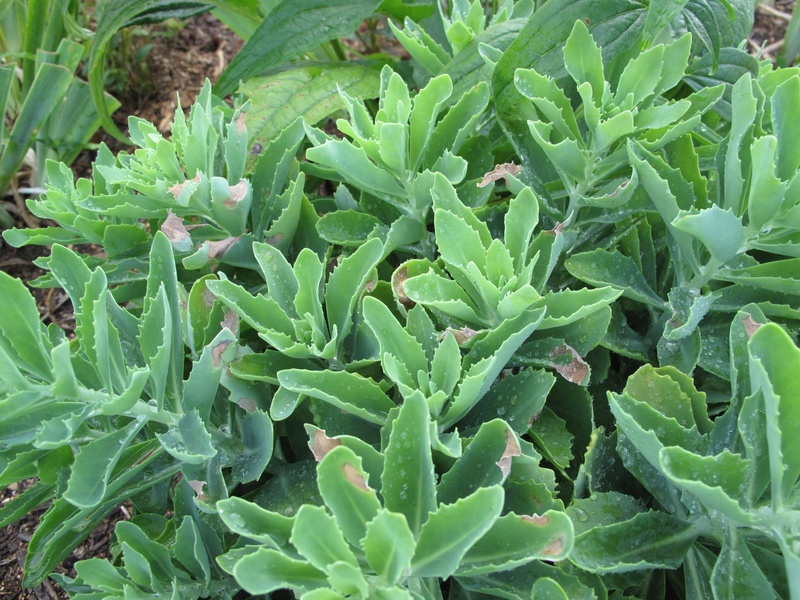 I planted Euphorbia ‘Shorty’ (Shorty Spurge) last spring and am happy with its color and form. Still covered in raindrops it seemed to be dancing in the morning light. Pansies are blooming throughout the meditation circle, but the plants themselves have not grown much. In spring they should fill out more. 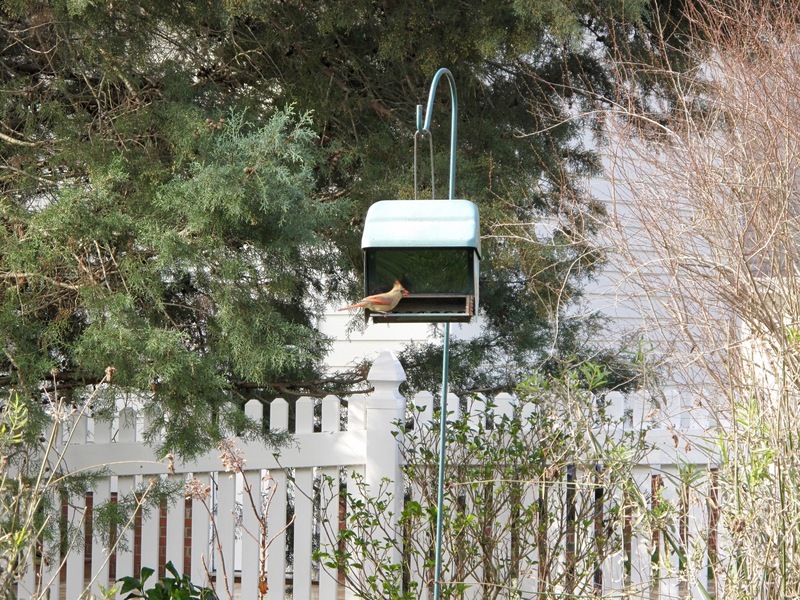 A female Northern Cardinal was one of many birds happy to find the feeder has been restocked. This entry was posted in garden and tagged Daphne odora 'Aureomarginata' (Winter daphne), garden almanac, meditation circle, winter garden on January 16, 2016 by pbmgarden. 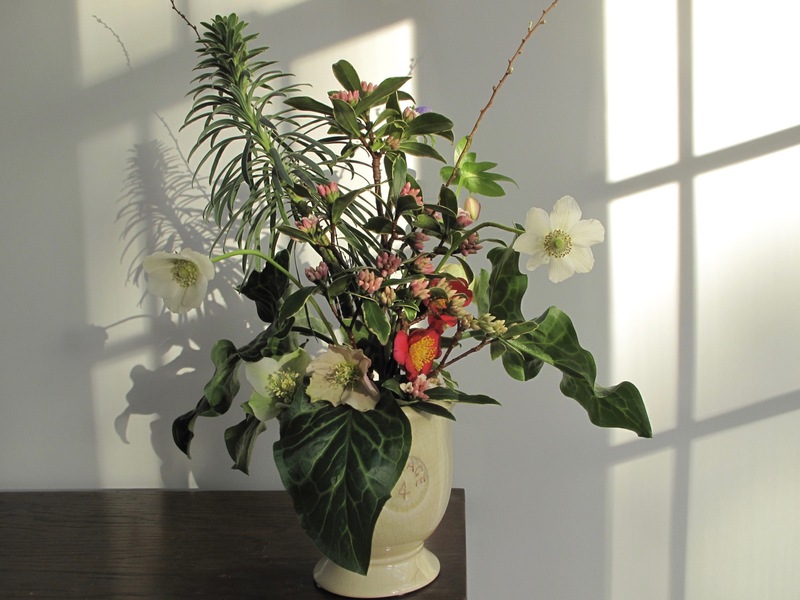 There was sunshine yesterday when I gathered a few flowers for today’s vase, but underfoot everything was squishy from many days of rain. 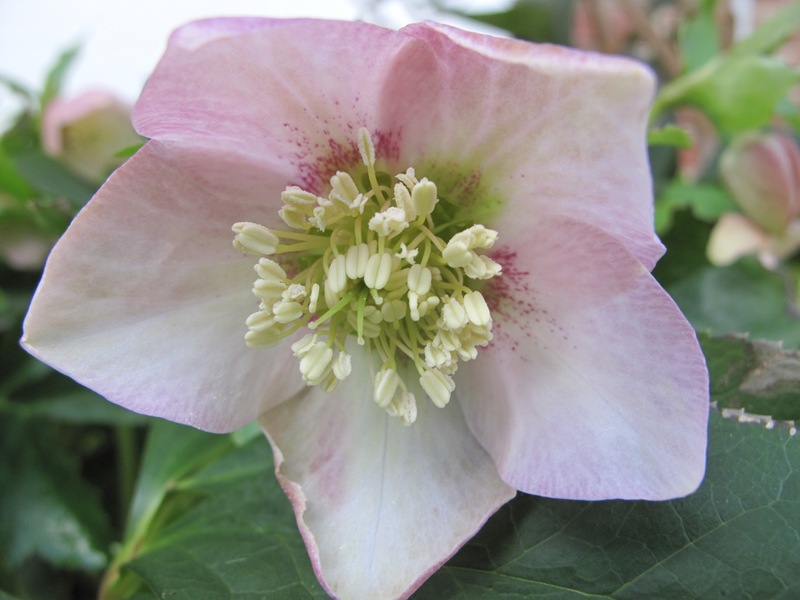 Not many blooms were available, even Hellebores have been slow to open. While lamenting the limited number of hellebores I noticed nearby some Arum italicum looking very healthy. 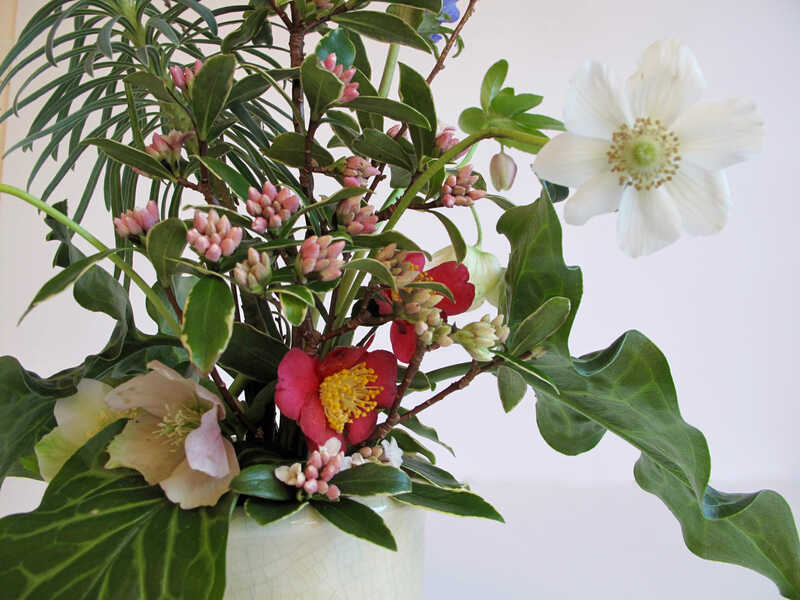 Its strongly patterned, glossy green foliage, along with a stalk of Euphorbia ‘Shorty’ and several stems of Spiraea, became the emphasis for this week’s arrangement. I supplemented the foliage with two white anemones that had survived the cold, wet weather, plus a single purplish-blue ‘Mr. Fokker’ in bud. 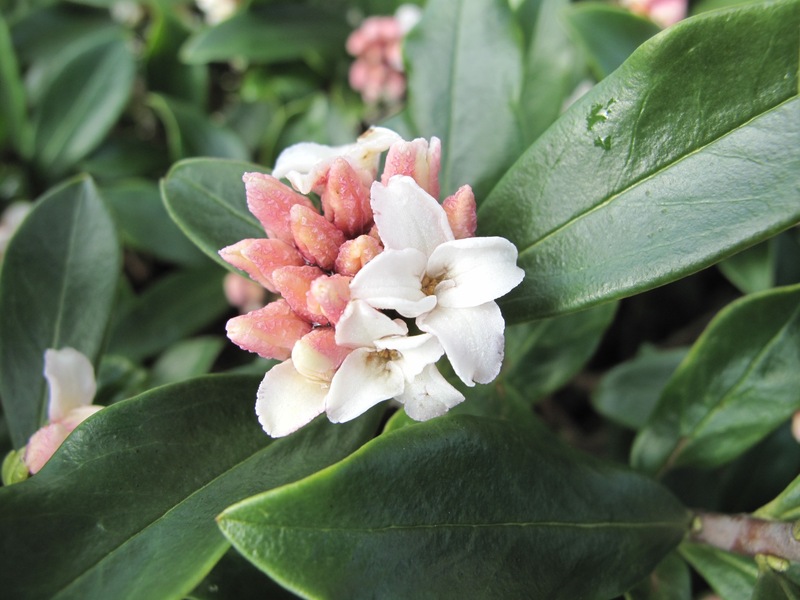 Several branches of Daphne odora ‘Aureomarginata’ contribute flowers, foliage and fragrance. 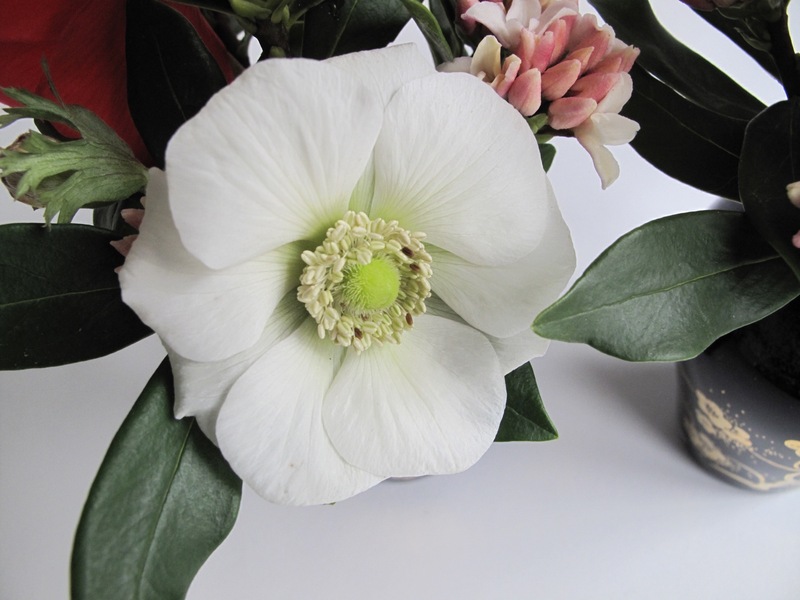 Completing the arrangement are the last two Camellia sasanqua ‘Yuletide’ of the season. 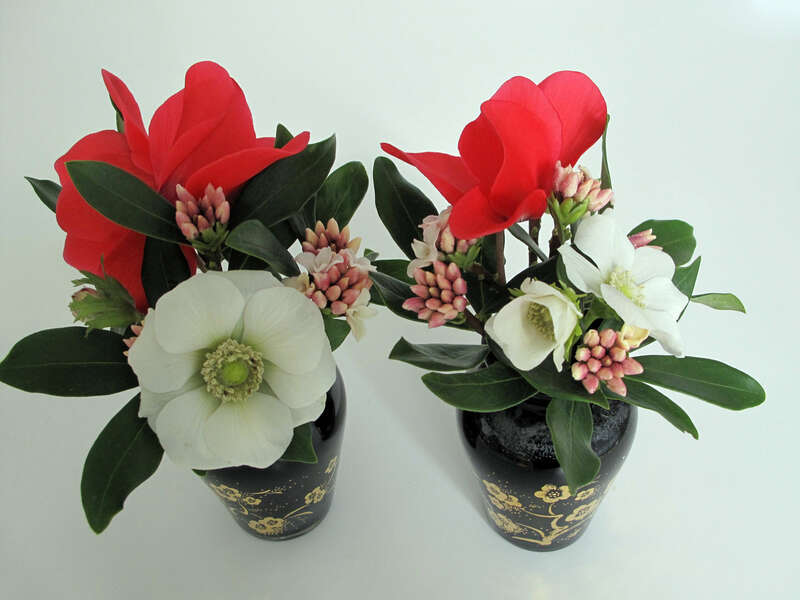 This entry was posted in garden and tagged Anemone coronaria, Camellia sasanqua 'Yuletide', Daphne odora 'Aureomarginata' (Winter daphne), flower arranging, flower design, in a vase on monday, nature photography on January 11, 2016 by pbmgarden. A second post today—time again for Garden Bloggers Foliage Day (GBFD), hosted by Christina at Garden of the Hesperides. 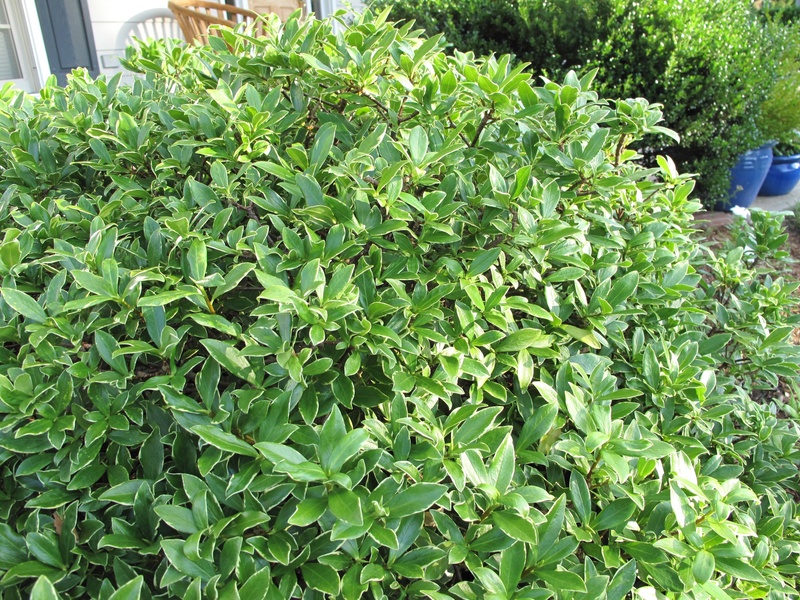 The foliage of three Daphne odora shrubs in the mixed hedge along the front porch has made a significant recovery. After the harsh cold winter their leaves were very brown and I worried they would not survive. Now it looks quite healthy. The river birch (not pictured) has been losing leaves for a month because of the dry weather and high temperatures. 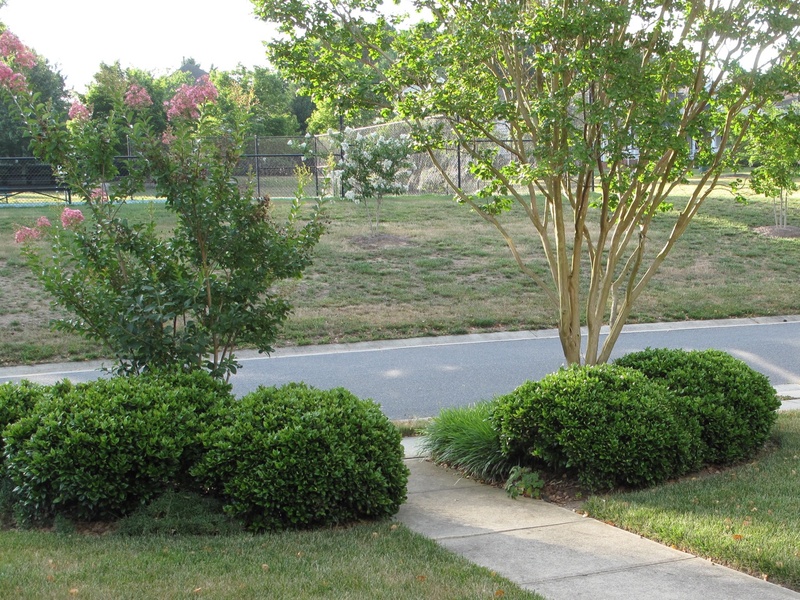 The front lawn is littered with them, making it look more like autumn is coming.In front a low compact hedge of Carissa Holly surrounds a crape myrtle on either side of the walkway. This area has not received any supplemental water, meaning it is holding up pretty well. 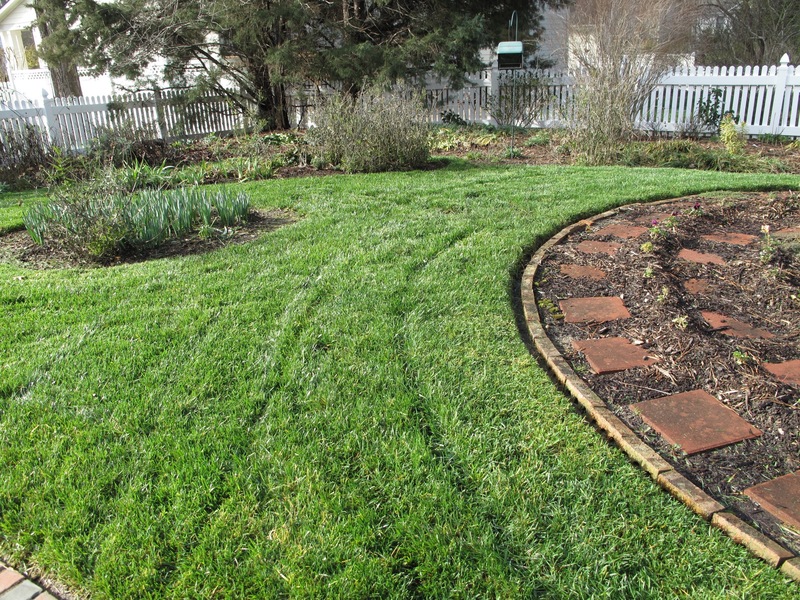 The fescue lawn should recover but not until fall. In back of the house where I have been watering, the garden is a mixed story. 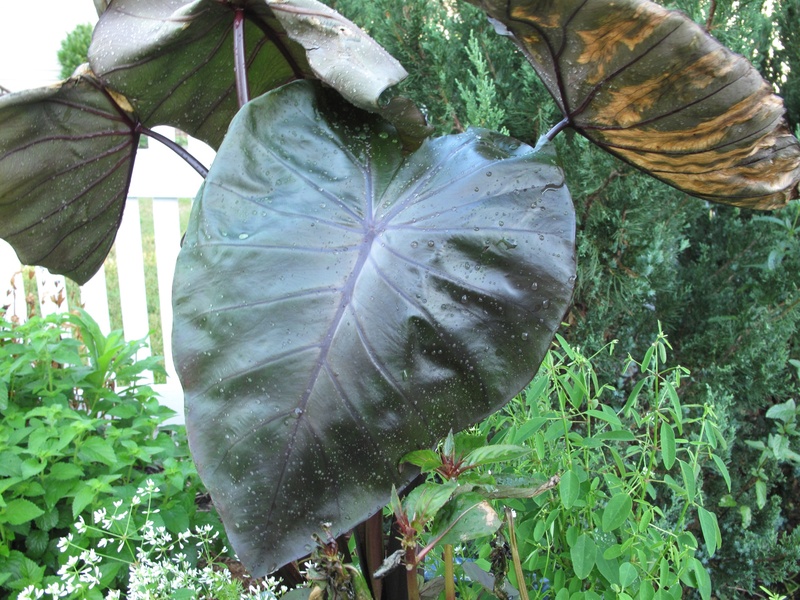 A new planter featuring Colocasia Royal Hawaiian ‘Black Coral’ (Black Coral Elephant Ear) looks very sad. 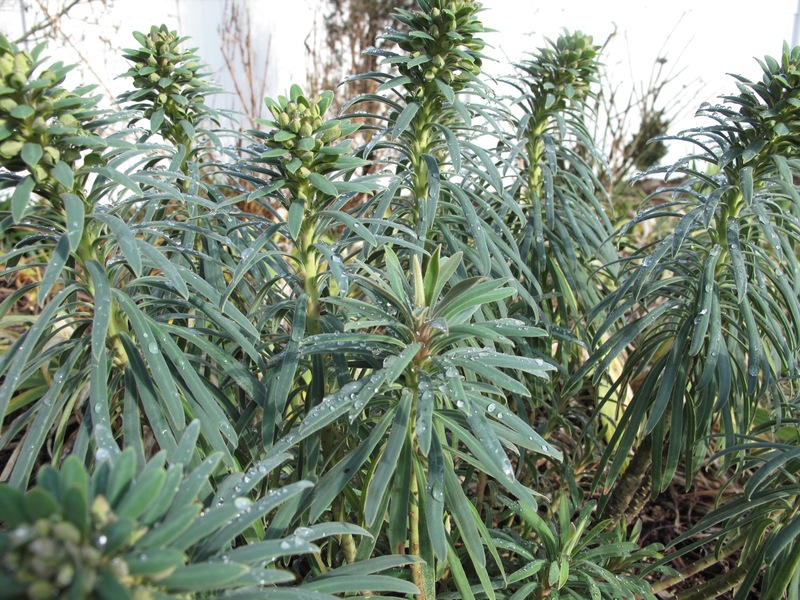 All the plants were designated for full sun, but Euphorbia Diamond Delight is the only one living up to its name. 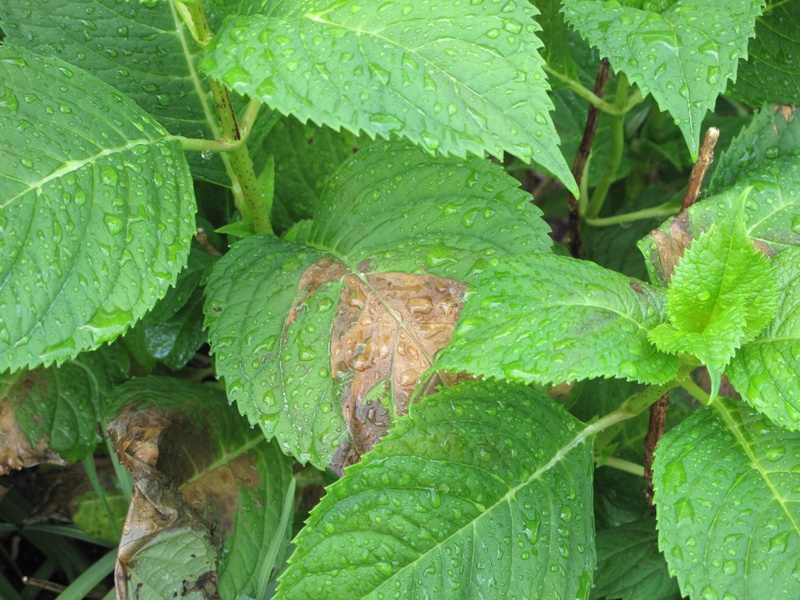 Foliage on Hydrangea macrophylla understandably shows distress from the sun. But I am surprised to see the leaves of Hylotelephium telephium ‘Herbstfreude’ (Autumn Joy) looking sunburned as well. Here are a sample of other plants around the garden whose foliage is looking healthy this week despite the weather. Thanks to Christina at Garden of the Hesperides for hosting. Read her June foliage update from her holiday in the US and see more links to foliage perspectives from many parts of the world. 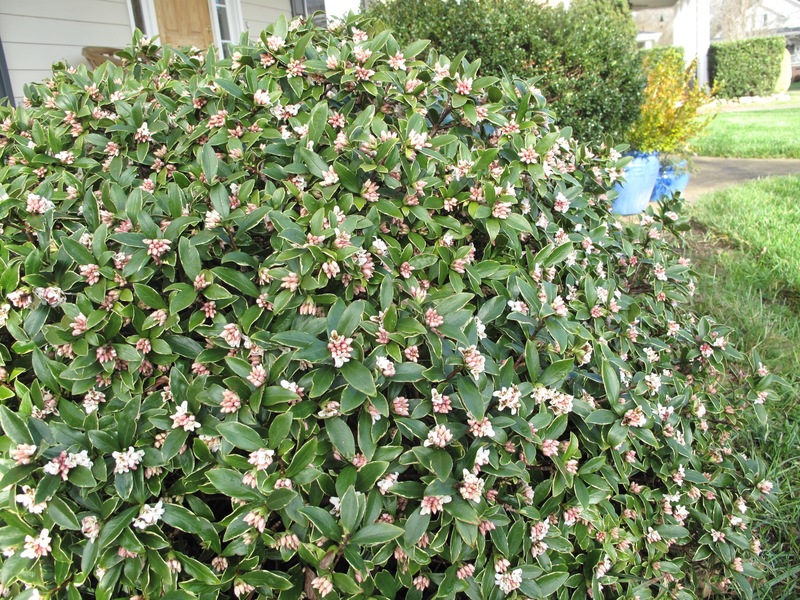 This entry was posted in garden and tagged Daphne odora 'Aureomarginata' (Winter daphne), Garden Bloggers Foliage Day, GBFD on June 22, 2015 by pbmgarden.